George Dallas of Bulno died 1st February 1943 aged 78. 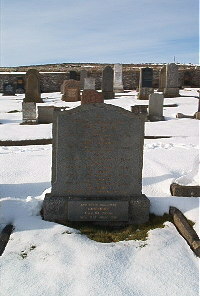 Wife Janet McBeath died 11th December 1941 aged 63. Son James Dallas died 26th August 1968 aged 57. Son Charles Dallas died 13th April 1939 aged 22. Son Robert Dallas died 17th February 1919 aged 2. Son George Dallas died 11th November 1973 aged 71. Son John Dallas died 22nd May 1980 aged 71. Daughter Catherine Dallas died 2nd July 1991 aged 84 .